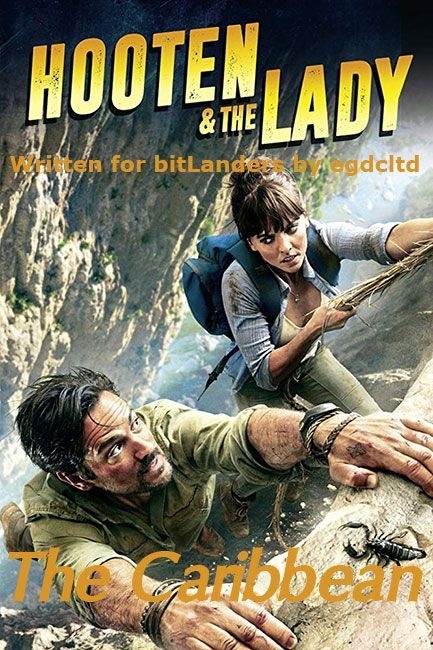 "The Caribbean" is episode eight of season one of Hooten & The Lady, an action adventure series about 'odd couple' partners that bears some resemblances to certain types of eighties films, and the season finale. In this episode, Lady Alex goes treasure-hunting in the Caribbean with Hooten days before her wedding. The episode opens on Old Providence Island in the Caribbean Sea. A really old - classic in most places - taxi is pulling up and Hooten gets out. He enters a bar and tells the bartender that he's looking for Caleb. The bartender opens a beer for Hooten then goes and knocks on a door at the back and tells his boss that Hooten is there. Hooten enters the rear room and says to Caleb that Caleb has something for him. Hooten throws some money onto Caleb's desk, who asks if he looks like a vending machine. Hooten replies that he hopes not, because he has issues with vending machines where they take his money and he has to beat them up to get the money back. Which is essentially a veiled threat. Hooten wants the address that Caleb was supposed to be getting him; Caleb is apparently working on it, but would like to know why Hooten wants it. Hooten is not sharing. Outside at a beach bar Hooten orders a scotch and a cold beer chaser when he hears a familiar voice. Said voice belongs to Lady Alex, who is not at all surprised to see Hooten. Hooten, however, wants to know how Alex knew where he was. The answer is because Hooten paid for his flight using the museum's credit card. Alex wondered if this was deliberate, in order to get her out there, but decided it was just stupidity. Alex believes that Hooten is looking for a map, which someone tried to sell. The dealer tried to rip him off and the map got torn in two. The map shows the location of a cask belonging to Captain Henry Morgan that was buried on the island, but it is now in two halves. Alex believes Hooten has one half and is looking for the owner of the second. Which he denies; then a young boy sent by Caleb shows that's precisely what Hooten is doing. Alex tells Hooten that she's been worried about him, after what happened in the previous episode, "Cambodia", with Kane. Hooten claims that he is fine, and he stays fine by not thinking about what Kane did to his family. He inquires if Alex isn't supposed to be getting married in a few days. Which she is. Alex wants to know if Hooten knows what's in the flask. He tells her that, after Morgan attacked Porto Bello, the governor of Panama City sent Morgan an emerald ring and a request not to attack. In return, Morgan sent back a pistol and a letter, saying that he would get them back when he visited Panama. All three items were supposedly buried in the cask, and are very valuable, so Hooten wants to sell them. Alex is surprised that Hooten did his homework for once, but he says he loved pirate stories as a kid. To which she points out that Captain Morgan was technically a privateer, not a pirate (the difference largely depends which side you're on). Alex tells Hooten that he needs her, but he claims to be able to outsmart her. So they go their separate ways, and Alex recovers the larger part of the map before Hooten. So she goes off into the island with her, very prepared guide, Julian. Of course, they are going to need each other eventually. Back in London, Lady Lindo-Parker is getting annoyed with her daughter and tells Edward that he needs to take a firm hold of her. Edward himself seeks Ella's advice, wanting to know if Alex truly wants to go through with the wedding. Ella tells Edward that she does - but the drama caused by Alex's mother is too much. A woman and a man turn up at Caleb's bar looking for Hooten as well. It seems that someone else is looking for the cask. This turns out a bit surprising. The episode has a bit of a cliff-hanger ending - it's sort of the start of a new story; fortunately, this one is tidied up - which is a shame because the series was cancelled, despite good reviews, and I did enjoy it.